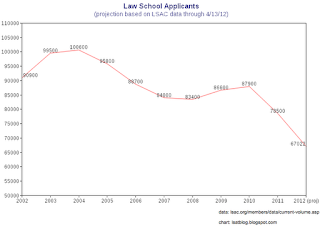 The Law School Admission Council's latest update indicates that the decline in the number of law school applicants is lessening little, if at all, compared to LSAC's last update. 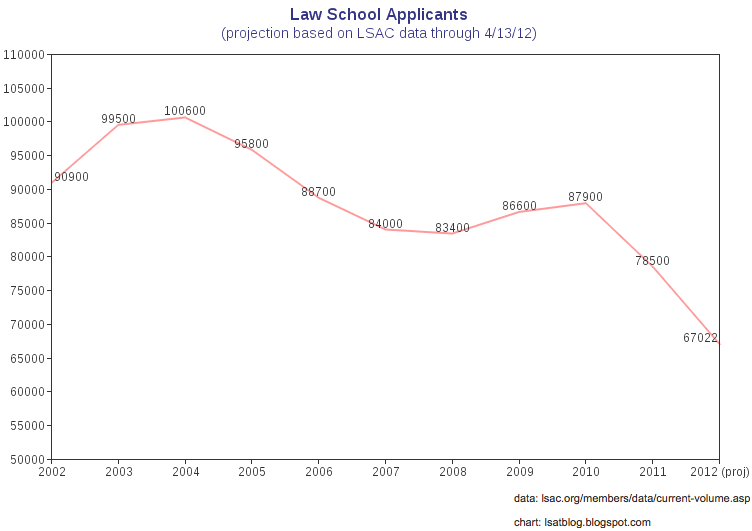 LSAC's newest data indicates that the number of applicants to ABA law schools has declined 15%, and that the number of ABA applications is down 12.9% from the same time last cycle (through 4/13/12). Based on this information, we can project that this cycle will have a total about 67,022 applicants. As such, we're looking at a decrease of approximately 23.8% in the number of law school applicants over the past 2 years (87,900 to 67,022). Since the number of applicants is falling by a greater amount than the number of applications (both in this past cycle and the one before), we can infer that the average applicant is applying to a greater number of schools this cycle than in the past few years. It's also worth noting that the decline in applicants with LSAT scores of 170-174 has softened from 20.7% to 20% from LSAC's previous update for this cycle. This suggests that some applicants with scores in this range are applying later than they did last year. Northwestern Law Dean Dan Rodriguez recently wrote that Northwestern has seen only a ~4% decline in applications this year and no decrease in the number of high-scoring applicants. An overall decline of only 4% is certainly plausible since Northwestern is, after all, in the Top 14. However, a 20% in the number of applicants scoring 170-174 is significant enough that one would expect it to be felt across the board at top schools. Unless, of course, the average high-scoring applicant is applying to a significantly greater number of schools this year than last. This might allow Northwestern (and others in the T14) to avoid a drop in the number of high-scoring applicants despite the overall shrinking pool of such applicants. If this is the case, such schools will be in for a surprise when the top-scoring applicants decide where to enroll. Many of these schools may find that their yield rates are far lower than they expected. The number of applicants to Canadian law schools is up 0.7%, and the number of applications is at the same level as last year. LSAC states, "Last year at this time, we had 97% of the preliminary final Canadian applicant count."